At least four teams, two courts and 20+ great attitudes is what it takes to make a FANTASTIC 3 on 3 Basketball League and that is just what we have at West Midland Family Center! A WMFC 3 on 3 league was born out of the interest shown from the WMFC Winter Basketball League players in early April 2012. In May 2012, Players came together with Recreation Director, Stacey Urbani to discuss the possibilities of WMFC hosting a 3 on 3 style league over the summer and fall. The group met, determined the appropriate playing time, rules/regulations and day of the week to launch the league. The summer 3 on 3 League included 5 teams that played a total of 3 games each and every Thursday night. The players called their own fouls, worked through rule discrepancies and, in partnership with Urbani, tweaked the players manual to perfect everything for the fall league. "Coming together on the rules/regulations was valuable to me as a director because the buy in from the players was there from the beginning", commented Urbani. "For six weeks in the summer the gym was filled with great athletes modeling positive leadership and attitudes, " continued Urbani. 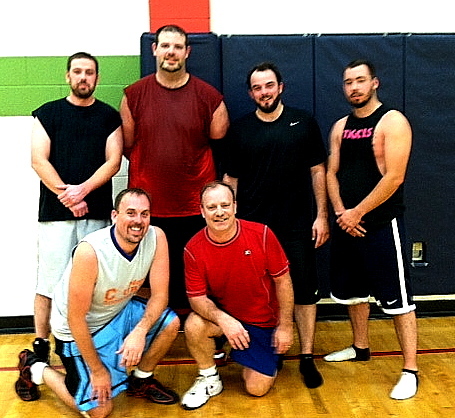 The last Tuesday in September was the beginning of the second 3 on 3 Basketball League season at WMFC. The league played on Tuesday nights and welcomed teams to one round robin tournament each week. During the final, sixth week of play, WMFC hosted a seeded bracket tournament to determine the league champions. "Playing 3 on 3 ball is harder than 5 on 5...there's no time to rest," commented one player when asked how he liked the league. "It's a great workout and it's fun!" Throughout the fall league, the players continued to play with great sportsmanship while having a lot of fun. The evidence of the positive attitudes continued to be displayed even on the last night when the final two teams played one another in the league championship title game. Fouls were called by the players fairly, teams worked together, and in the end the players didn't just want a "winners" photo, but they wanted a photo where both teams were photographed together! "Everyone played hard and we had a lot of fun," commented several of the players from the first place team, "could we all be in the photo?" The deadline to join the WMFC Winter Basketball League is fast approaching. For more information please contact Stacey Urbani, 989-832-3256.